Drawing inspiration from the word Chamarré, wich [sic] means "an explosion of colours and richly ornamented". In this perfume, the warm breath of lavender in combination with aldehydes paves the path to sensual treats such as powdered iris from Florence, seductive rose absolue from Turkey and delicate violet, ending in a gentle embrace of cashmeran, opoponax and ambre gris. Additional notes include clary sage. LIke the notes listed; might be very nice for winter. 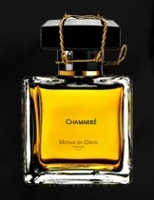 Their choice of ‘chamarre’ for the name is dubious, though; yes, it’s an adjective that means ‘adorned’, but it frequently refers to something that is overly decorated and in bad taste, like a piece of clothing or furniture with too much gold braid or embroidery, or too many tassels, . . .. Gaudy! I like that– though really it could apply to so many fragrances, especially from the ’80s. Absolutely…..and all their 80’s flankers: Really Gaudy, Extremely Gaudy, Outrageously Gaudy, Undeniably Gaudy and well, you get the idea. I cannot speak to the word chamarré or the negative connotations, but her style tends towards “richly ornamented”, so in that sense it seems a good fit. LOL…somebody needs to do a scent inspired by a velvet Elvis! Oh wow…that just triggered an old scent memory. Anyone else do those paint-by-numbers as a child? OMG — I know *exactly* what that smells like. Who knew? Boozy and medicinal almost sounds good, in a perverse way. Maybe some rose in there, too. Don’t forget the peanut butter and banana notes. I have to say, I liked Elvis too- he had a good voice! But the black velvet pictures of him- well, yes, banana, booze, coughsyrup medicine-cherry-mint flavored- rose, cheap licorice candy, and a heavy overtly synthetic musk. Darn, I can’t do lavender. I’ve used it so much as a relaxant it does smells medicinal or masculine to me. Otherwise it sound’s classy wassy. Kiss the Elvis clock but throw back the toothless wonder! This sounds SO good to me. Looks good too – I love the classic bottle [it certainly isn’t gaudy or overadorned – not that I would necessarily mind that]. I don’t know who, if anyone, is carrying the line in the US now, but pretty sure Les Senteurs ships overseas. After famously being mugged and left for dead in Paris by Nuit Noire, the description of this new scent as “a dark, sweet, woody oriental of immense warmth and seduction” fills me with utter terror. Robin, lavender I have used medicinally for years and it also smells masculine to me. Does it smell different in women’s perfumes? This one sounds like a must smell, but definitely worried about the lavender. Sure, and it sounds like this will be a floral blend, not a lavender soliflore. If I’d be a women, I’d only bought them for those bottles, haha. Amazing the champagne effect.